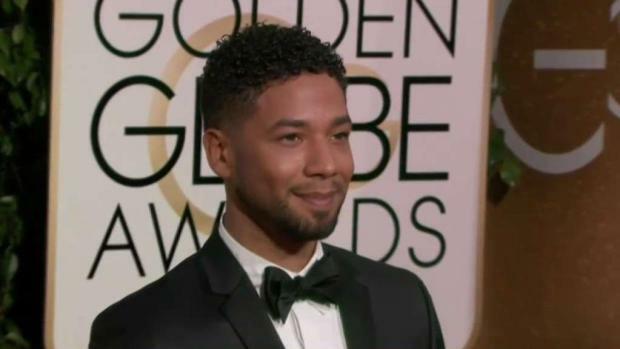 Chicago police detectives located Wednesday a surveillance camera that shows "potential persons of interest" wanted for questioning in connection an alleged attack on "Empire" actor Jussie Smollett, a department spokesman said. Police said they were planning to put out a community alert with photos from the camera at some point Wednesday evening. Detectives are seeking to identify and interview the two subjects depicted in the picture, walking on New Street near Illinois, between 1:30 a.m. to 1:45 a.m. in order to determine whether they may have any involvement in the reported incident, or if they may have witnessed the incident, police said. The images released by police show two shadowy figures with barely distinguishable features. Detectives have reviewed surveillance footage of Smollett walking to a downtown Chicago apartment after an early-morning visit to a Subway restaurant, but none of it showed an attack on the actor, a police official said Wednesday. Mayor Rahm Emanuel spoke about the release of the images during a press conference on cold weather preparations Wednesday night. Emanuel said the police department was working “aggressively” to get to the bottom of what happened. Investigators "for the most part" can confirm the route Smollett took early Tuesday when he says he was attacked by two masked men along a street in the Streeterville neighborhood, police spokesman Anthony Guglielmi said. However, there are gaps and none of the footage police have reviewed shows an attack, he said.